KAWS has been exhibited in a number of museum projects and exhibitions over the years. His first work was for NYC's New Museum bookstore, and has since shown at the Aldrich Contemporary Art Museum, MOCA Art in The Streets, and a recent return visit to the New Museum. 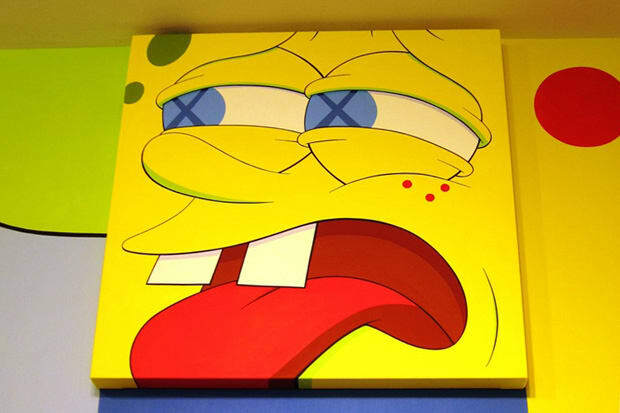 Eric Parker: "I've been aware of KAWS since 1999. I had a friend who was a curator in Tokyo who would come to my studio after he'd visit KAWS, so I'd hear about this kid all the time and what he was doing. I then saw his work in the window of the New Museum bookstore back in 2000. I happened to be with my kids trick or treating in his building one year and we hit his studio. I saw a couple paintings and we started chatting, but we didn't start hanging out until a couple years after that."